Also see Summer-active perennials provide flexibility – Craig and Woody Oliver– case study. Craig and Woody Oliver with their dog Indy. To evaluate the potential of summer active tall fescue for the Dunkeld area. Pastures: 300 ha of native pasture, 450 ha of improved pastures – plantain, sub clovers, chicory and tall fescue. The property is densely timbered with around two mature redgums (Eucalyptus camaldulensis) per hectare. The health of natural resources is a significant factor in all decision making and planning on the farm. 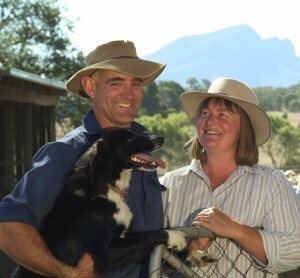 The Oliver’s manage their property with the aim of increasing profitability and labour efficiency whilst improving the health and diversity of the farm ecosystem. The property contains areas of native grasses, which are managed with rotational grazing. The area frequently receives some good summer rainfall, which has encouraged the Oliver’s to integrate summer active grasses (tall fescue) and herbs (chicory and plantain) into phalaris and sub clover pastures. This has enabled them to increase stocking rates and has reduce their workload. Prior to participating as a Supporting Site, the area was dominated by annuals and productivity was impaired by significant amounts of onion grass (Romulea rosea) and silver grass (Vulpia sp.). Summer active tall fescue was sown in spring 2008. A paddock of previously established chicory, plantain and sub clover was also used as a comparison at the site. In 2009, the tall fescue paddock carried 15 DSE/ha compared to 8 DSE/ha on nearby degraded native pasture. The chicory, plantain and sub clover pasture carried 18 DSE/ha. Further data for the site is not available. Sowing summer active perennials has enabled the Oliver’s to progress their aims for the property by increasing stocking rates and reducing the need for supplementary feeding over the summer/ autumn period. Thank are extended to Woody and Craig Oliver for hosting the Supporting Site. This Site was supported by Caring for Our Country, Central Highlands Agribusiness Forum, Australian Wool Innovation, Agriculture Victoriaand Future Farm Industries CRC through the National EverGraze Project .